Fronds forked once or several times, to 2 m long; pinnules to 4 cm long, green; ultimate segments of mature fronds 2–4 mm long, flat or only slightly recurved, lower surface usually glaucous; lateral axes glabrous or nearly so. 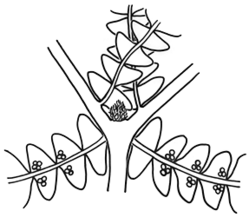 Distribution and occurrence: A scrambling species found near cliffs, in open forest or on rainforest margins. Other Australian states: Qld ?Vic.